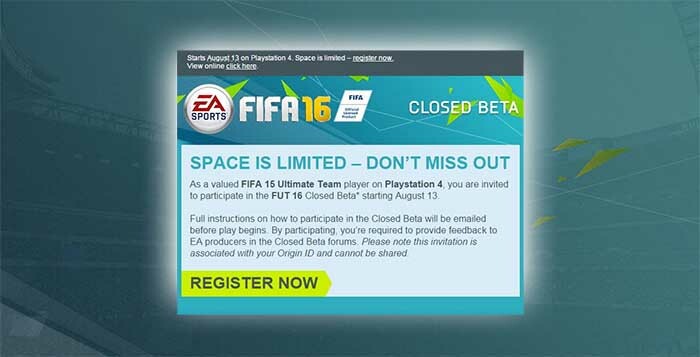 The FIFA Beta main purpose is to test the game. It was created for players to try out a FIFA game mode and give the developer feedback on anomalies they might find, and also suggest potential alterations. It has also got the particularity of promoting the game itself. This test version is exclusive for Playstation 4 and Xbox One. It is not available for old-gen consoles and PC. Usually, it is released in late August, after the Gamescom. To have the chance to play, players have to be invited by Electronic Arts. In the FIFA closed beta testing all game modes are tested at the same time, from the first to the last day. The difference is that the invites are addressed specifically to one game mode. Leagues, players and rosters in the beta are likely be the same as the last FIFA. Gameplay and interfaces will have changed.